I have certain jar files to be loaded into "Parasoft Preferences > System Property" which requires JAVA "1.7" but SOATest 9.10 have "1.8"... so i need to downgrade Java to 1.7... so i can submit a claims. Any suggestion? Java 8 is able to use jar files that were compiled with Java 7, so you should have no problem adding your jars built with Java 7 into SOAtest and using them in your test scenarios. However, if you'd still like to run SOAtest with Java 7, see this post. @jakubiak thanks much, however i'm seeing some issues with compatibility therefore i have to downgrade it to 1.7. Can you be more specific? Where is that message being reported? Actually, one of my colleagues told me what the problem probably is. SOAtest 9.10 ships with Eclipse 4.6, which requires Java 8 in order to run. 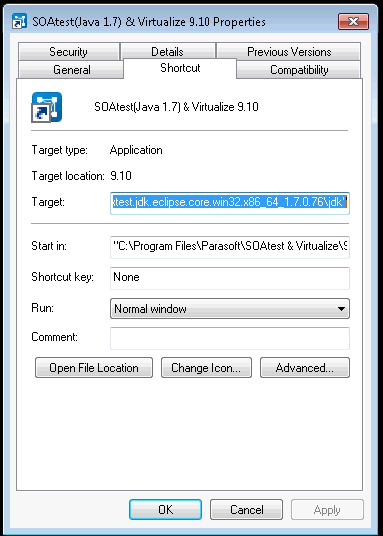 If you need to run with Java 7, then you would need to get Eclipse 4.5 or older, install SOAtest via update site, and configure that Eclipse to run with Java 7. However, I'm still surprised that this would be necessary. Could you tell us what error you are seeing when you use Java 8 with your jars? As mentioned, if you need to run with Java 7 then you also need to downgrade the Eclipse. You'll need to install your own Eclipse 4.5 (aka "Mars"). SOAtest can be installed into Eclipse from a p2 update site archive (available from Parasoft). Otherwise, see if you can apply the fix pack mentioned in the IBM Support article, using newer version of the thinclient jars. can you provide more details about ..."SOAtest can be installed into Eclipse from a p2 update site archive (available from Parasoft)." You need reach out to your contact with Parasoft for installation guides and download instructions. Once you receive the update site from Parasoft, there is an installation guide in the SOAtest installation directory under the manuals folder that explains how to install the update site.